Solid hardwood tables are built to last. 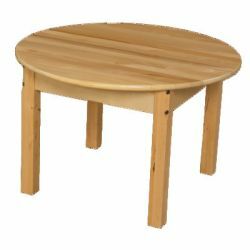 Full 3/4" thick solid hardwood tops and 1 3/4" square hardwood legs make these tables a great selection for durability and value. Carefully rounded safety corners and edges keep your children safe and happy. Non-toxic natural finish. Easy assembly.